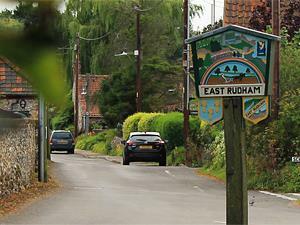 East Rudham and West Rudham at East and West Rudham01553 763044work VillageSituated on the A148, connecting King’s Lynn with Fakenham the villages of East Rudham and West Rudham offer a great base to stay of visit in the heart of the West Norfolk countryside. At West Rudham the village green is a focal point around which a pub, The Crown, a tea room, village store and local independent shops can be found. A second pub The Dukes Head is found at West Rudham. The annual village festival is held over two days in July, where East and West Rudham join forces to stage an array of events and activities including a horticultural show, male beauty contest, donkey rides, sheep race, craft stall, bell ringing, bouncy castle, tennis tournament and much more. Unsurprisingly the villages have two churches. St Peter at West Rudham is a fine medieval church dates from the 13th century, though there was a church here in Saxon times. The building fell into disrepair in the 1970's and was made redundant. It is now leased to the Norfolk Churches Trust and at least four services a year are held here. Situated on the A148, connecting King’s Lynn with Fakenham the villages of East Rudham and West Rudham offer a great base to stay of visit in the heart of the West Norfolk countryside. At West Rudham the village green is a focal point around which a pub, The Crown, a tea room, village store and local independent shops can be found. A second pub The Dukes Head is found at West Rudham. The Church of St Mary at East Rudham is now the main functional church serving the villages. Largely rebuilt 1876 there is evidence of older parts of the building in chancel, south transept and south porch.